We are back with week 2 of our coast to coast summer survival series! 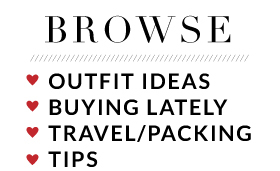 I have teamed up with 4 other bloggers as we share our summer survival tips, tricks, and topics every Tuesday in August. I am representing the midwest, and in case you missed last week's theme, you can catch yourself up HERE! This week is all about the Summer Olympics! If you're anything like us, it's the only thing you've been watching since the opening ceremony on Friday night. It's really hard not to get completely sucked in and captivated by every event. Reality TV at its absolute best! Today, I thought I would cover three simple topics related to the Olympics: 1) Showing team spirit 2) Dressing like an Olympian and 3) Training like an Olympian. 1. Showing team spirit: Start pulling out your 4th of July and Memorial Day outfits because they're all relevant again! If you don't like being super literal by wearing actual stars and stripes, the red, white, and blue combo works well on their own. Lucky for you, a certain baseball team I love here in the midwest has team colors that coincide with our USA colors. I'm not shy when it comes to showing my team spirit. The more obnoxious, the better. 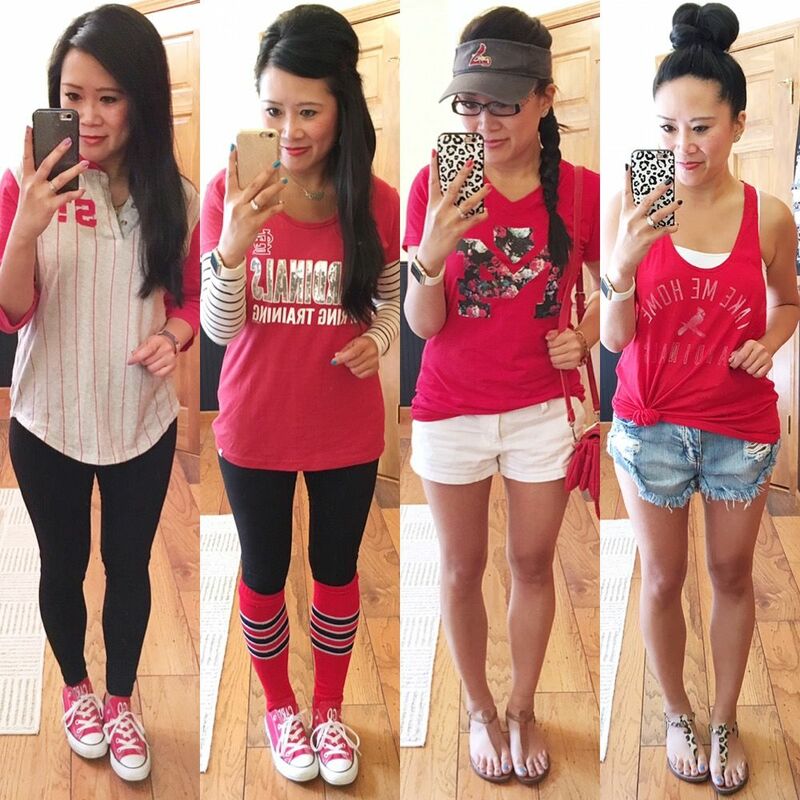 I don't share too many game day outfits on the blog, but since it fits the team spirit theme, I thought I would share some of my more recent outfits I've worn to watch some Cardinals baseball. I linked to some of the more "real life" pieces in the above collage. For the most part, I buy Cardinals gear wherever I can - sports stores, at the stadium, Target, Walmart, and sometimes Victoria's Secret. If you live in St. Louis, going to a baseball came is as much of a *must* as it is to see the arch! We go to about 20 games a year, so I could never have a shortage of outfits! 2. Dressing like an Olympian: Ok, so maybe your way of showing team spirit isn't by dressing like a fan but rather by vamping up your workout wear instead! I have a weakness for bold, colorful leggings. They just make my heart happy and give me something to look forward to, even when I'm not particularly feeling like working out. I realized that I haven't done a Fabletics review since June! Let me take this time to talk about my August picks (middle outfit above.) The only thing I love better than a good printed legging is a tank with a gorgeous back. The fit of this tank is perfect and the criss-cross straps at the back keep this tank from looking anything but boring. 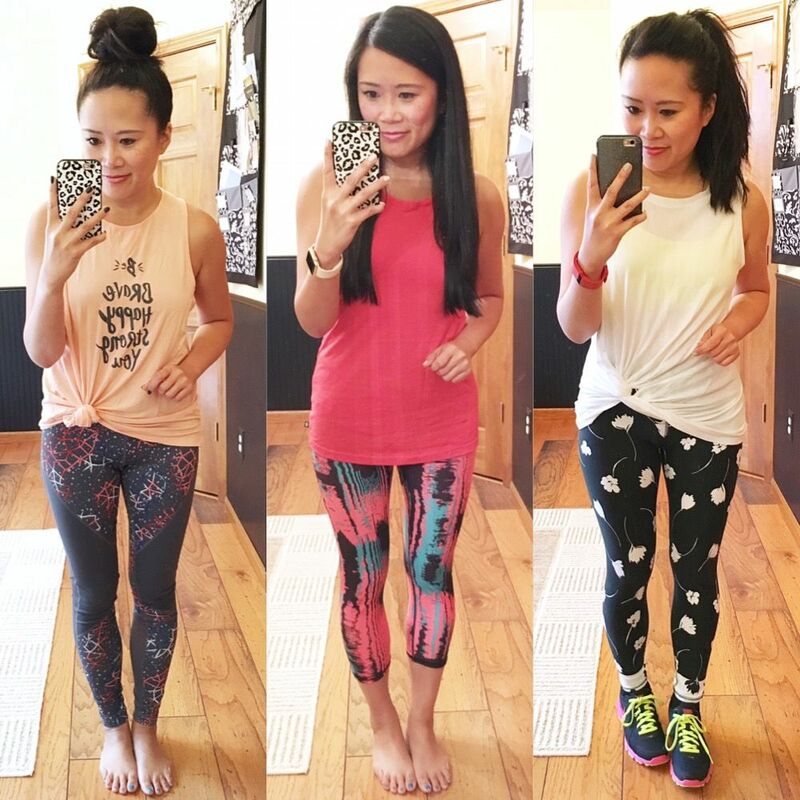 The Winn capris may be my most favorite leggings I've gotten from them yet! They hold you in, but are completely seamless at the waistline. One positive about being in St. Louis is that we actually have a brick and mortar Fabletics store. If you're more of a touchy feely person, definitely take advantage of one of the store locations so you can at least understand your sizing. I've consistently been the same size in all of the pieces I've purchased from them. 3. Training like an Olympian: Watching all of these athletes compete really amazes me and reminds me how much the human body can really do! Gymnastics is hands down my most favorite thing to watch. Knowing how difficult certain exercises and poses can be in Yoga and Pilates just makes me be even more inspired by their strength and abilities! 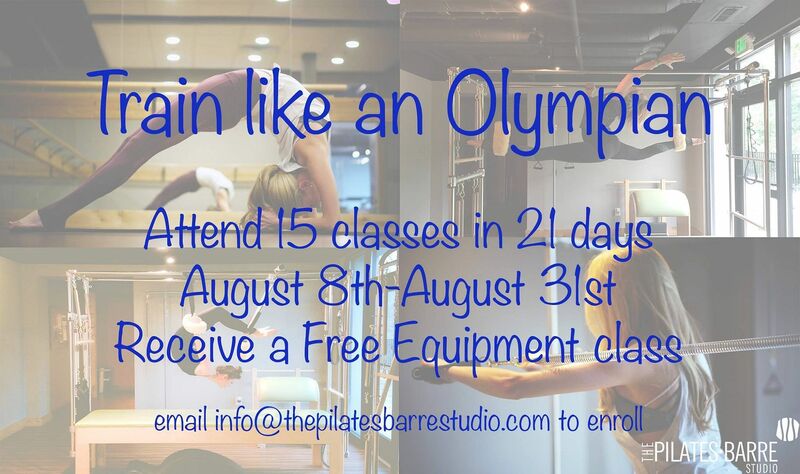 Watching all of the Olympics coverage and learning more about the people that make up team USA encouraged me to sign up for this Pilates challenge at my studio! This summer was all about yoga, and while I still love practicing yoga, Pilates was always my first love. August has slowed down a bit so I thought it would be the perfect opportunity to finish out this summer on a high note and push myself even further. I usually only go to the Pilates studio once or twice a week. Ramping that up to at least 5 days a week for 3 weeks will be very interesting! I'm excited to see progress and what changes, even if they are small, happen to my body from now until then. While my goal is to attend at least 15 classes from now until the 31st, I'm currently signed up for 19 classes. I would love to be able to hit all 19, but I figure that gives me a class or two to cancel in case life happens, while still being able to reach my target. I'm hoping to finally take some photos and video of me inside the studio as well, so stay tuned for that! It kind of makes me sad that I've been practicing for 3 years now and I haven't properly documented it on the blog! Pilates and Barre seem to be really big here in the midwest, though I'm gathering that it's pretty trendy around the country as well? You will have to let me know! 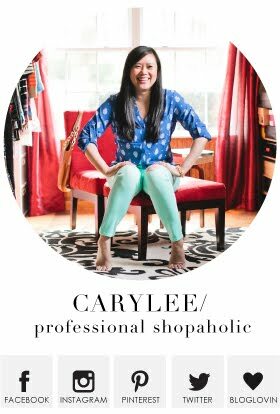 Follow through our coast-to-coast blog hop by heading north to Pennsylvania for Jo-Lynne's take on this week's theme, or simply use the links above to meet each blogger in this series. Omgosh your leggings are adorable!! Especially loving the star printed ones! you make me want to try pilates so badly. you workout clothes collection is growing. What color is on your toes in the sock picture? I LOVE it! It is Essie "Play Date!" You are no doubt the best dressed fan at any Cardinals game and I love how many fun options you have! I'm also excited to hear how things go after your Pilates challenge this month! Will you burn out or just love it even more? TBD! Great post! 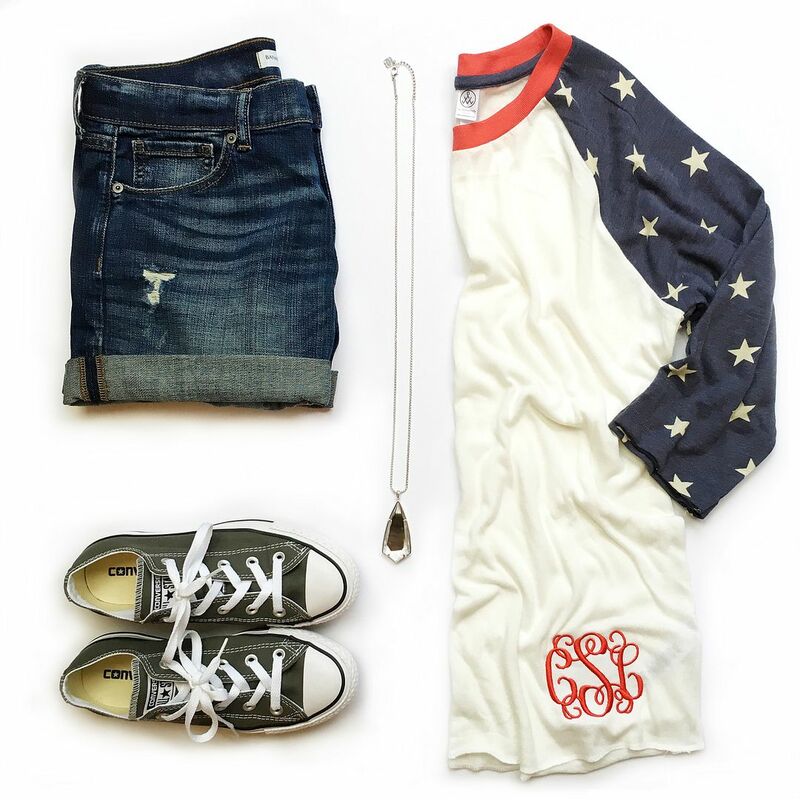 I LOVE the monogrammed baseball tee! Does it run true to size? Yes it does! It has a generous fit. I would get your normal size. i'm obsessed with the olympics, need to get myself some USA attire haha! You are seriously rocking these outfits! I have never tried pilates! Need to try it sometime!